North Carolina has seen a dramatic increase in substance misuse and opioid overdose rates in recent years. Since 2010, for example, deaths resulting from heroin overdoses in North Carolina have increased by 884 percent. This increase accelerates the need for adequately trained emergency medical services (EMS) personnel. Blue Cross NC President and CEO, Patrick Conway, MD, observes a training operating room (OR) scenario at Rockingham Community College. 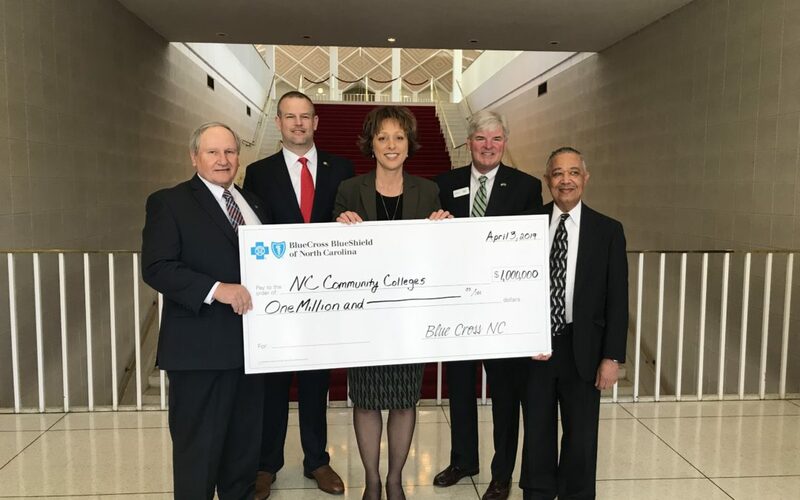 To help end the opioid epidemic in our state, Blue Cross and Blue Shield of North Carolina (Blue Cross NC) has invested $1 million with the North Carolina Community College System (NCCCS). This investment will support the funding of associate degree programs in Emergency Medical Services (EMS). The five community colleges selected are in counties hit hardest by the opioid epidemic: Brunswick, Lenoir, Rockingham, South Piedmont and Wilkes. 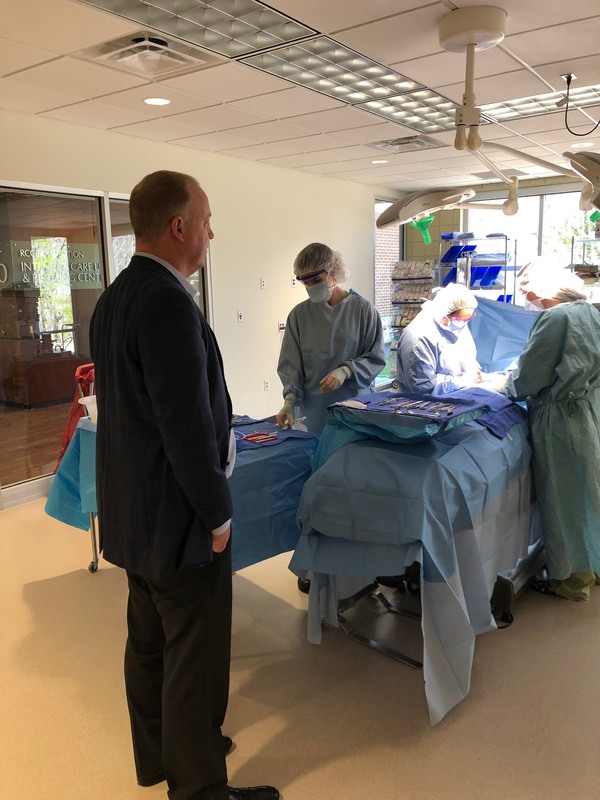 Recently, Blue Cross NC connected with Jason Collins, program director, Emergency Medical Services, at Rockingham Community College – one of the colleges that received funding. Jason was once a student in the EMS program which he now oversees, and has worked for both Rockingham and Guilford EMS. Why do you think giving back to rural communities, such as Rockingham, is important for EMS students? JC: Most of our students at Rockingham Community College come from Rockingham County. Placing these students in an EMS setting in their home county lets the students see just how much of an impact their work is having on their own community. Feeling invested in and connected to their own community can only help improve problems facing Rockingham County like the opioid epidemic. What unique perspective does a community college EMS program give students? 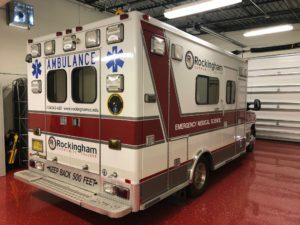 JC: Usually when a citizen calls 911 in Rockingham County, he or she is a patient or connected to the patient. The EMS program here at Rockingham Community gives students an opportunity to see what it is like on the other side – they are now the ones treating the patient. This is truly when they realize what impact they are making on their community. How have you seen the opioid epidemic affect communities within the state? Blue Cross NC funding will help to replace outdated training equipment and technology. JC: Working part time with EMS, I have personally seen the opioid epidemic in full force. Not a shift goes by that doesn’t have at least one opioid overdose call. Many times, EMS personnel receives several overdose calls in a 12-hour shift. When it comes to the opioid epidemic, a person’s social status doesn’t matter either; I have seen victims from across the spectrum. How have you seen the opioid epidemic affect what’s asked of our emergency response and health care providers? JC: Opioid patients are increasingly becoming a problem for emergency response teams and health care providers. Emergency departments are already overcrowded, and these individuals are causing more strain on the staff. Here in Rockingham County, our law enforcement and firefighters have been trained to deal with an opioid call to help ease the burden on EMS teams, and they now also have opioid-reversing medication that can be used before EMS arrives on the scene. How do you hope to see educational opportunities for students interested in fields such as EMS and nursing expand in the future? JC: With more opportunities comes more diverse education. The EMS career in general is advancing; the North Carolina Office of EMS is proposing minimum requirements for an individual to receive Paramedic certification. This is slated to go into effect in 2023, but has not been approved yet. At Rockingham Community, we are offering classes in Critical Care, Prehospital Preceptor and Community Paramedicine – just to name a few – so that the paramedics can also work in a non-traditional setting. Rockingham Community College has had students from all over the state, and even out-of-state, come and take these specialty classes. We’re excited to join forces with these community colleges, and know that by helping fund EMS associate degree programs across the state, we can train and inspire the next generation of EMS professionals. For more on the opioid epidemic, visit our opioid resources page. Laura Eberhard is a Communications Specialist at Blue Cross NC. She believes there’s no better way to learn, than through the stories of others.